Live, Move, Have your Being, a not-for-profit organization is organizing its third edition of a seminar series on fertility and pregnancy-related challenges on February 23, 2018, at the Coconut Groove Hotel. The event, which is in partnership with Mahogany Consult, a PR, Event Management, and human development consulting firm is in two parts. There will be a Public lecture on the theme ‘Living with Infertility’ which will provide useful information to couples on how to prevent and treat infertility or live with it in the likely event that a couple may not be able to bear children. During the second session, participants will be given the opportunity to have one-on-one sessions with fertility specialists and clinical psychologists to start a possible healing process. Fertility or the lack of it remains a significant part of relationships and marriage across the world. Many marriages have broken apart, others are threatened by infertility either of the man or the woman. It is a subject many would rather not want to talk about publicly for fear of stigmatization by people within the society. Yet it is a subject that must be encouraged within families and the society at large. 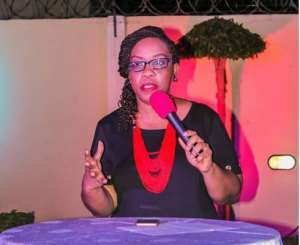 Founder of Live, Move, Have your Being and Senior Consultant at Mahogany Consult, Baaba Cofie, told Myjoyonline.com the lecture is to demystify the concept of infertility and to encourage peaceful coexistence between couples. She stated that ‘It’s a difficult topic but we want couples going through fertility challenges to experience professional medical and psychosocial support to guide them find solutions and closure’. Author of a true story, “In the womb of time”, which highlights the pain, frustrations couples go through in search of babies, Mrs Cofie believes the subject of infertility must be of concern to all. The lecture, scheduled to start at 5:30pm, Friday, will be addressed by Dr Florence Naab, CEO of Oh!Happy Day Foundation. She is also the Senior Lecturer at the University of Ghana, Nursing and midwifery school. The ‘free’ one-on-one consultation session will be facilitated by fertility specialists and psychologists including Dr Henaku-Larbi and Dr. Homia from Medifem Multi-specialist Hospital and Fertility Centre, as well as Dr Irene Kretchy and Mrs Owiredua Kwofie, both clinical psychologists.